This large 4.2m x 7.2m Garden Room has been installed at the bottom of our customer’s long garden in Brighton, East Sussex. 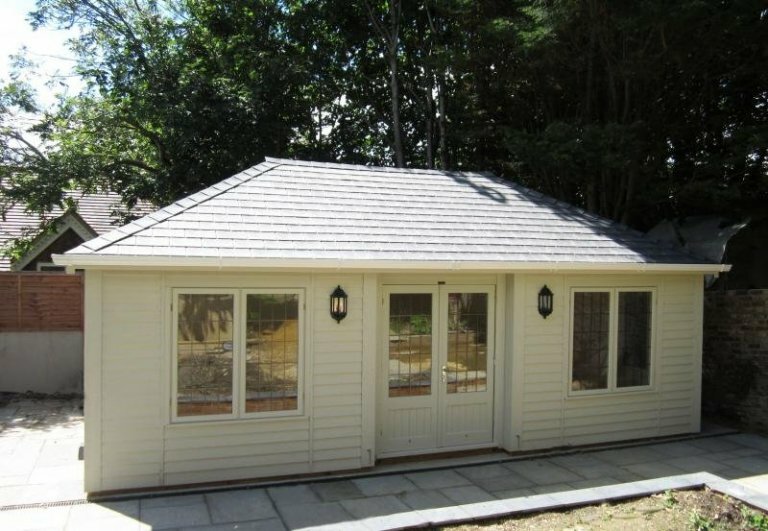 As with all other garden rooms, our dedicated team delivered and installed it free of charge. This Garden Room was intended to become the garden's focal point once landscaping had finished. The larger size of the building helps create a commanding presence. It still projects a soft, homely feel with corner boards, inset doors and outdoor lights. The goal was to create a grand yet charming entertainment space. 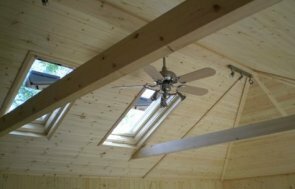 So their Garden Room can be used all year round, the customers opted for insulated walls, floor and ceiling as well as a heater with their electric pack. The floor also has a natural lacquer on it. 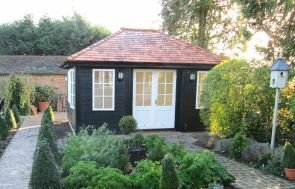 With the hipped roof and grey slate effect tiles, white guttering that frames the roof, leaded windows, and weatherboard cladding, the Garden Room has a traditional, country style that our customers really love. It was finished with Sandstone paint from our nature-inspired Valtti collection, helping it to blend with the concrete slabs around the building. The windows are all double glazed and can be opened. The light, bright feel this exudes is also seen in the matchboard lining, which is painted in Ivory Valtti. Our Garden Rooms are designed so you can work, relax and entertain in luxury and style. You could also opt for a Garden Room with a Veranda. Our years of bespoke construction means the possibilities are endless. If you're interested in viewing our full range of Garden Buildings, we invite you to come and visit one of our seven UK Show Centres. 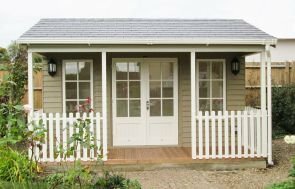 For any queries about our garden buildings, you can Request a Callback from one of our team. You can also Contact Us here, or call us on 01760 444 229.